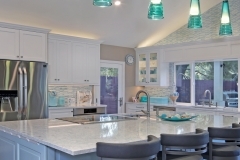 Eclectic Kitchen in Laguna Hills | Le Gourmet Kitchen Ltd. 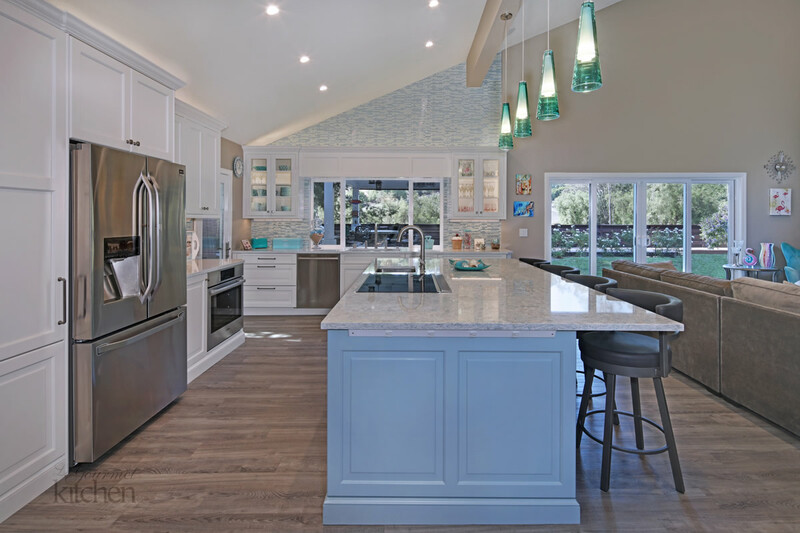 This eclectic kitchen design in Laguna Hills is the perfect combination of location, layout, and style. 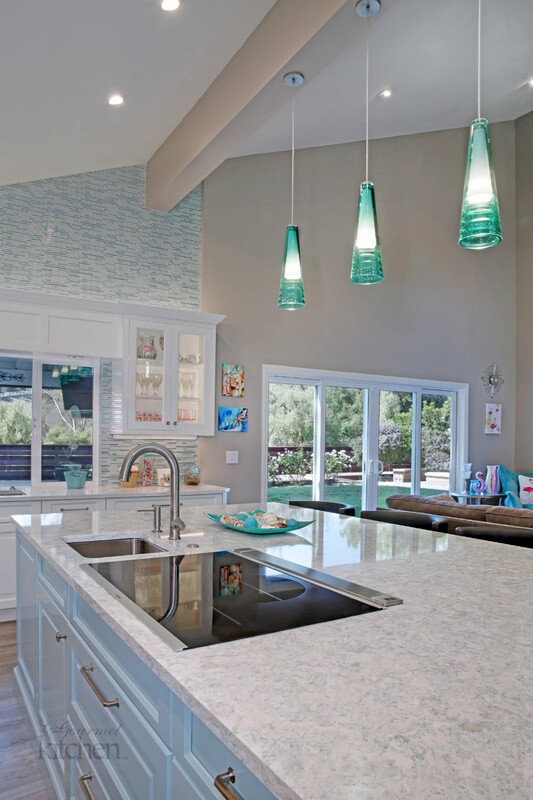 The kitchen design, by Bruce Colucci, maximizes the use of natural light and open space. This was accomplished by removing a load bearing wall and installing new Milgard windows and sliding glass doors. The resulting high ceiling and exposed beam is a show stopping feature, and the mosaic glass tile backsplash extends from countertop to ceiling along the angled wall, drawing your eye to the kitchen and showcasing the vaulted ceiling. The kitchen island offers a dividing line between the food preparation zones and the entertaining zone in this great room style space. 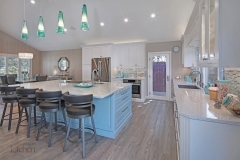 The open plan kitchen design is perfect for everything from entertaining to intimate gatherings to daily family use. The island includes a Kohler sink and an induction cooktop with Best’s Cattura downdraft ventilation. This layout offers a sociable environment. It allows you to cook while chatting with guests seated on the other side of the island or in the adjacent living space. The set up is also perfect for keeping an eye on the kids, watching a sporting event on the large wall mounted flatscreen, or helping with homework while preparing dinner. 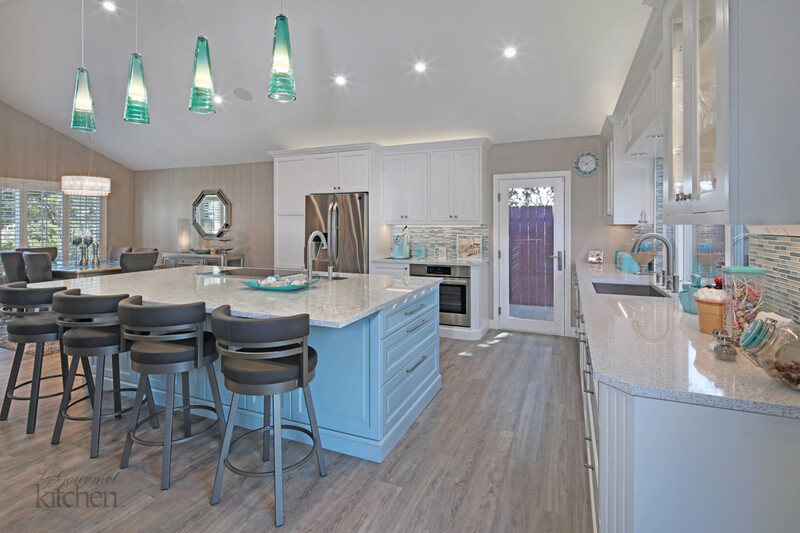 The white Wood Mode-Brookhaven cabinets are beautifully offset by the Aqua Shade island cabinetry, all topped by a Cambria quartz countertop. 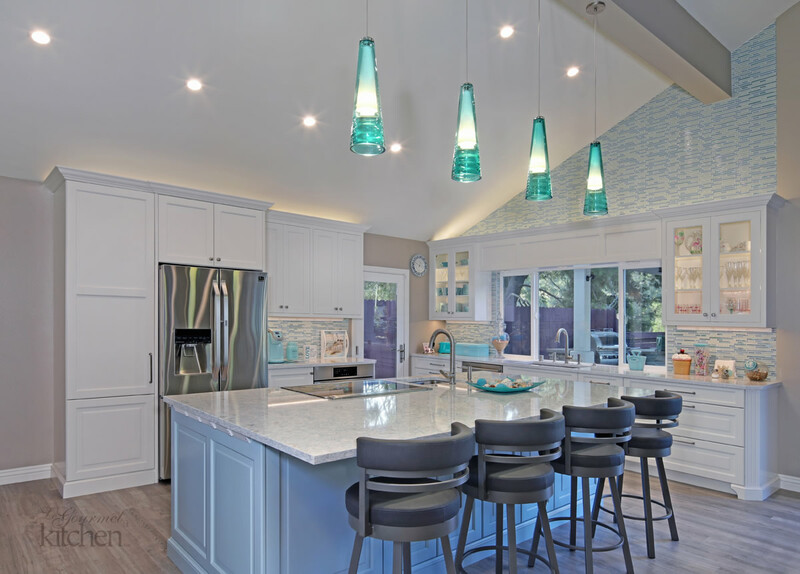 The design incorporates this feature color throughout the space, from the island pendant lights to the toaster to dishes in the glass front cabinets. 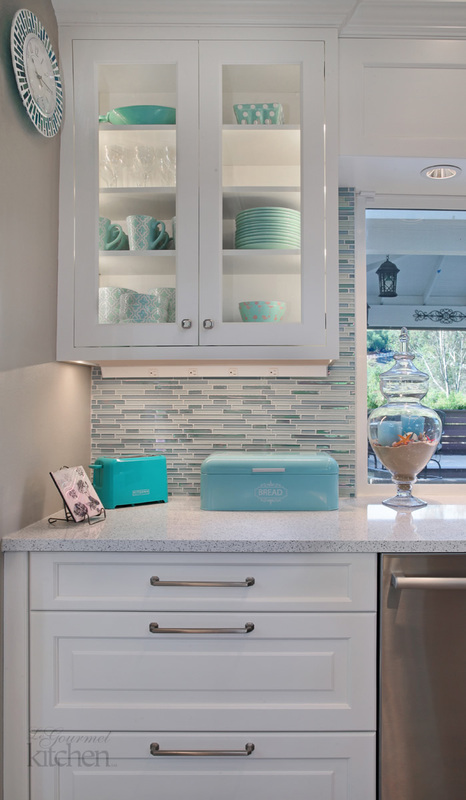 The pop of color offers a contrast to the white cabinetry and adds an element of the homeowner’s personal style to the design. This kitchen design is packed with amazing features and appliances, including a Bosch induction cooktop, oven and dishwasher, along with a large LG French door refrigerator. 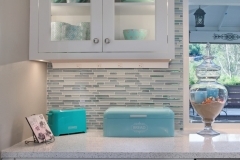 Task Lighting angled power strips are strategically placed throughout the kitchen and offer ample space to power small appliances or other electronics. 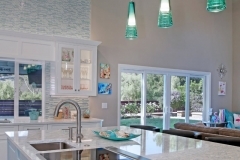 Lutron Caseta lighting controls were added, allowing the homeowner to change the lighting and control the mood of the space from anywhere with wireless controls.